By building of Sela Tunnel the road will become all weather traffic and will be a big boost for the movement of defence forces and Civil vehicle and tourism development in Tawang sector. 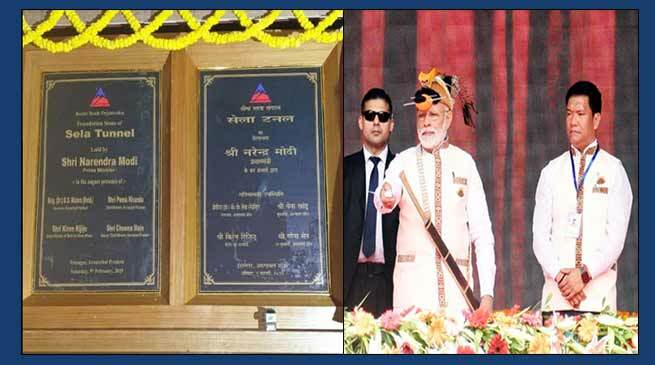 Prime Minister Narendra Modi today laid down the foundation stone of Sela Tunnel to be constructed by Border Roads Organisation among various other projects in Arunachal Pradesh. The 2.23KM Tunnel and 9.22km approach road will be constructed at a height of 13700ft above sea level. The Tunnel will bypass the existing road between km 229 and km 247 on BCT Road. During snowfall the road at Sela Top get closed and surface become slippery affecting the moment of traffic. By constructing the Sela Tunnel the road will become all weather traffic and will be a big boost for the movement of defence forces and Civil vehicle and tourism development in Tawang sector. This will also reduce the travelling time by more than one hour. The sanction of DPR by MOD and award of the work by the DGBR has been made on war footing under the dynamic leadership by Hon’ble RRM and commendable action in processing the DPR and awarding the work by Lt Gen Harpal Singh, AVSM, VSM, DGBR and his team. All the land acquisition and forest clearance for the Project has been given by the State Administration in record time to enable BRO to comments the work immediately.